Gasoline prices have been relatively flat for the past couple of years, despite claims this Fool made otherwise. What did he miss in his hypothesis? I admit, I was wrong. Last year, I made the claim that gasoline prices were closer to heading toward $5 a gallon than many of us should be comfortable with. Since that time, though, U.S. retail gasoline prices have dropped more than 8%. 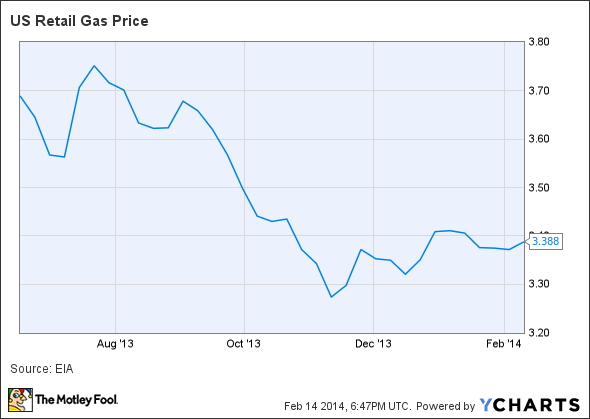 U.S. Retail Gas Price data by YCharts. Why was I so wildly wrong about the price of gas? Have the fundamentals of the oil market changed so much in less than a year that my hypothesis is no longer valid? Let's look at two major factors that have kept gasoline prices down and see whether these trends can continue. For the past couple of years, gasoline demand in the U.S. has been on the decline. Strangely, though, that trend reversed in 2013, yet we still saw gas prices drop. 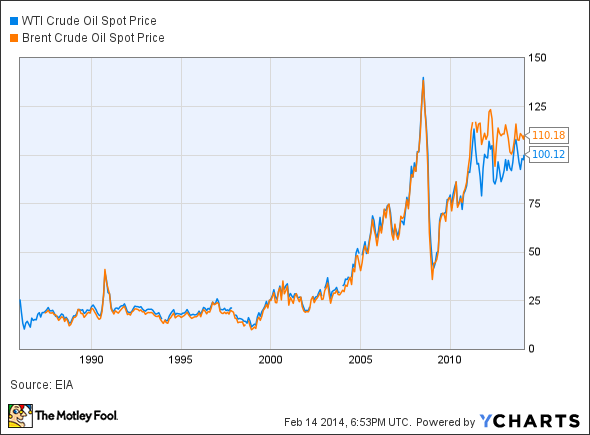 Also, Brent crude, the standard oil price for the world market, has been flat. Clearly there is something else at work, here, and that something is that U.S. crude prices have diverged from the international price. The global oil market has pretty much always been a very fluid one, where oil can move from country to country without major price differences. For decades, there has been very little difference in U.S. and international prices. Amazingly, this trend has actually changed in recent years. Since 2011, the price of West Texas intermediate, the U.S. benchmark, has been priced at a pretty hefty discount to Brent. But U.S. crude isn't the only thing keeping gas prices low here. The price for Canadian crude, the United States' largest source of imported crude, has been consistently sold at a discount greater than $20 to similar crude types over the past couple of years as well. Sources: U.S. Energy Information Administration, author's calculations. Surging supply: The discovery and successful exploitation of tight oil resources across the U.S. has sent U.S. production into the stratosphere. U.S.-based independent exploration and production companies such as EOG Resources (NYSE:EOG) and Continental Resources (NYSE:CLR) have grown production by almost 40% per year over this time frame in the three major U.S. shale oil formations -- the Permain Basin and Eagle Ford formations in Texas and the Bakken formation in North Dakota. Combined, all companies working in these regions have added more than 2.5 million barrels per day of oil to the U.S. supply mix. Canada has also seen its production climb more than 12% over the past couple of years. Inadequate Infrastructure: Even though we seem to be awash with oil and gas, not all of these new resources have adequate pipeline and railway access to move the oil to demand centers (refineries). These bottlenecks cause producers to sell their product at a lower price just so it can go out the door. This is an even greater problem for Canada, and it is part of the reason the country has been supporting the construction of the Keystone XL and other oil pipelines. When you combine these two factors, you get the cheap oil prices we have seen today. In fact, U.S. crude prices could become even further isolated from international prices if we were to maintain the strict regulations on exporting domestic crude. It's hard to tell if an isolated crude market would immediately translate to cheaper gasoline for you and me, though, because U.S. refiners such as Valero (NYSE:VLO) still export gasoline and diesel in massive quantities -- more than 3.6 million barrels per day, to be precise. We can thump our collective chests and say that U.S. crude production has taken some of OPEC's pricing power away, but the reality is that the combination of Russia and the OPEC nations control more than 45% of the world's oil production. More importantly, though, is that OPEC nations have spare production capacity. About 3.2 million barrels per day of potential production is held back from the global markets by the OPEC member states. The ability to open and shut the valves to balance the global supply and demand equation has been a very powerful tool. OPEC is happy with the current price of oil: Saudi Arabia currently needs to produce about 9.5 million barrels per day at $85 per barrel to maintain its federal budget. Also, OPEC has stated multiple times that it is comfortable with $100 oil because it provides OPEC with adequate funds and doesn't severely impede global economic growth. So there is no need to restrict supply. It's not a unified group: Getting OPEC members to work as one is becoming more and more like herding cats. Both Libya's and Iran's oil production have disappeared, Nigeria and Venezuela have struggled to meet its goals, and Iraq wants to triple production but can't seem to get the infrastructure in place. All of this means Saudi Arabia has needed to pick up the slack, which means slightly less control over the market. While the actual reason for OPEC's current stance is not completely clear, the result is. Global oil prices have been relatively flat for the past three years. Can these trends keep us under $5 a gallon? To say we will never see gasoline prices go over $5 is betting against basic economic principles like inflation. Of course it will get to that level someday. The more appropriate question is how long until it actually happens. The forecasts for U.S. oil production estimate that we will add another 2 million barrels per day of production between now and the end of 2015. As long as domestic production increases, we should be able to continue to isolate ourselves from international crude prices to a certain degree. Also, since the U.S. and Canada have limited outlets for their crude supplies, and OPEC maintains production levels to keep oil around $100 a barrel, then the chances that gasoline will go above $5 are pretty slim for the next couple of years or so. Building one of these for each offshore field is not cheap. Source: BP media relations. Longer term, though, there is still the issue of rising global demand and the cost of doing business. ExxonMobil (NYSE:XOM) estimates that oil demand will increase by at least another 25% between now and 2040, and the increasing costs of extraction from offshore oil exploration and remote locations such as the Arctic will eventually lead to higher prices. The factors I've laid out are the ones we can see today, but that doesn't necessarily mean they will continue on this trajectory. There are tons of things out there that could change this outlook in a heartbeat. So while it's beneficial to understand the reasons we haven't seen gas prices change, don't hold them as gospel. No one wants to predict that gas prices will rise, but it is a reality that we each have to live with because of the complex web known as the global oil market. Luckily, I have been wrong so far about the price of gas, and I hope that I continue to be wrong about this one as long as possible.